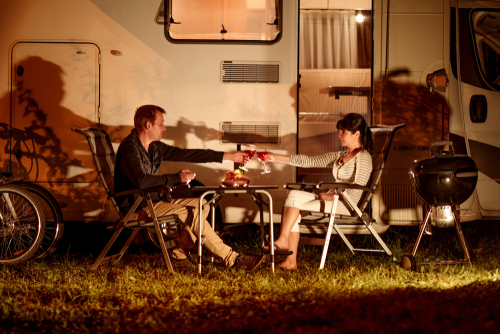 Adjusting to life in an RV can be a challenge. It’s easy to overindulge, move to fast, and burn yourself out. That’s why it’s important that you learn how to balance your recreational time with downtime. These tips can help you to achieve a balanced lifestyle, whether you’re on the road for a week or full-time. When you’re out in your RV for weeks or even months at a time, it’s important to use your RV’s kitchen to cook meals as if you were at your house. Not only does it help to save you money that you’d otherwise spend eating out at restaurants, but it also helps to keep you fit since you’ll generally eat better with home-cooked meals than you would with greasy fast food. On top of that, eating meals with the friends and family you’re traveling with can help everyone to bond and stay on the same page. While an active lifestyle of hiking, biking, climbing, and swimming is often the “recreational” portion of RVing, there’s always room for more exercise. This is especially true if your idea of recreational leans more towards touring museums or fishing on a dock. And there’s nothing wrong with that, but it may mean that you need to work in a work out into your schedule. Wearing yourself out with exercise a few times a week can help your energy levels for the rest of the week regardless of what else you’re planning to do with your time. Don’t rush through your day and don’t rush through destinations. Whether you’re out on the road for a week or for years, you’ll get more out of your time in your RV if you maintain a slower pace of travel. Don’t overstuff your days and make sure to spend quality time at each destination rather than trying to stuff in as many new destinations as possible. This will make each place you go more memorable. Otherwise, your travels will feel like a blur of activity and the places you visit will feel less distinct and, therefore, less memorable. Sure, your life is basically one big vacation if you’ve given yourself over to RVing full-time. But that doesn’t mean you should livelike you’re on vacation. Vacation-style living means indulging, which is fine for finite vacations that last for a week before you go back to your house and job. But if there’s no end in sight and no house or job to go back to, indulging yourself everywhere you go will lead to poor health and will burn you out on living your life on the road. Stay frugal when you shop. Cook your own meals. Get plenty of sleep. Maintain your tamer hobbies, like reading, painting, or knitting. Don’t feel like you need to purchase admittance to somewhere each day. If your life is just one big vacation, soon it won’t feel like a vacation any longer. Before you hit the roads in your RV this season, bring your travel trailer, motorhome or fifth wheel by Fretz RV. Our certified RV technicians will take all of the necessary steps to ensure your RV is safe to hit the road for another balanced RV season.